2018 Alfa Romeo Stelvio Revealed! The latest SUV to hit 60 mph in under four seconds. When it comes to naming a vehicle after a roadway, you could do a lot worse than Italy’s Stelvio Pass. More than 9000 feet above sea level at its highest point and consisting of more than 48 hairpin corners on the north side alone, it’s considered one of the best driving roads in the world. So it’s only natural that Alfa Romeo would co-opt the moniker for its new sports…uh, SUV? Okay, so it’s not exactly a surprise. And the Alfa Romeo Stelvio just made its in-the-metal debut at the 2016 Los Angeles auto show. Assembled at Alfa’s Cassino plant in Frosinone, Italy, the Stelvio is built on the same platform as the Giulia and will be offered in three trim levels: Stelvio, Stelvio Ti, and the high-performance Stelvio Quadrifoglio, which has enough distinct features and tuning to be considered a separate model. While the Stelvio and Stelvio Ti both rely on a 280-hp turbocharged 2.0-liter inline-four for motivation, the high-performance Quadrifoglio utilizes the 505-hp 2.9-liter turbocharged V-6 from the Alfa Romeo Giulia Quadrifoglio. Aluminum is used extensively in the construction of every Stelvio, including the front and rear subframes, the suspension components (control arms in front, multilink in the rear), the doors, and the fenders; the rear crossmember is partly made of composite plastics to pare more weight. Controller (CDC) and driver-adjustable Alfa DNA Drive Mode system, which permits the driver to select among Dynamic, Natural, and Advanced Efficiency modes to modify throttle response, boost pressure, and the settings of the adaptive suspension on the Ti and Quadrifoglio. On the Quadrifoglio, it’s called DNA Pro, while on the base Stelvio, adaptive suspension damping is not available. A 7.0-inch TFT screen and a pair of traditional white-on-black dial gauges deliver pertinent info to the driver. Leather seating, a Formula 1–inspired flat-bottom steering wheel, push-button start, a backup camera, rear parking sensors, and a power hatch are part of the standard kit. Alfa’s Q4 all-wheel-drive system is standard across the lineup. Harman/Kardon supplies an optional 900-watt, 14-speaker audio system. The standard set of 18-inch aluminum wheels is only one of seven choices, in sizes ranging from 18 to 21 inches in diameter. There are 13 exterior colors offered. The Ti trim adds standard 19-inch wheels, authentic wood interior trim, and an 8.8-inch infotainment screen in place of the standard 6.5-inch display. Ti buyers will also have the option of selecting Sport and Lusso packages; however, at press time, exact details on these packages were not available. Although the 505-hp 2.9-liter V-6 and its 443 lb-ft of torque may not be all that separates the Stelvio Quadrifoglio from the humbler base and Ti trims, it’s certainly a formidable difference. Alfa is not pulling any punches here, claiming the Quadrifoglio can knock off the zero-to-60-mph run in 3.9 seconds and is good for a top speed of 177 mph. Helping the cause is an eight-speed automatic transmission, a torque-vectoring rear differential, high-performance suspension tune, more robust brakes, and Quadrifoglio-specific wheels. A 200-mph speedometer, a leather-wrapped steering wheel, carbon-fiber trim, and a set of 12-way adjustable seats carry the racy theme inside. Those interested in taking things even further can specify lightweight carbon-fiber Sparco seats and Brembo carbon-ceramic brakes. Building on the basics of Alfa’s DNA Drive Mode system, the Quadrifoglio’s DNA Pro setup features a fourth setting, appropriately named Race. When selected, it enables an overboost function for the turbos, opens up the two-mode exhaust, turns off the stability control, delivers sharper brake and steering settings, and dials up more aggressive transmission and throttle calibrations. Basically, it sets the stage for the driver to emerge as either a hero or a zero, based entirely on skill level. 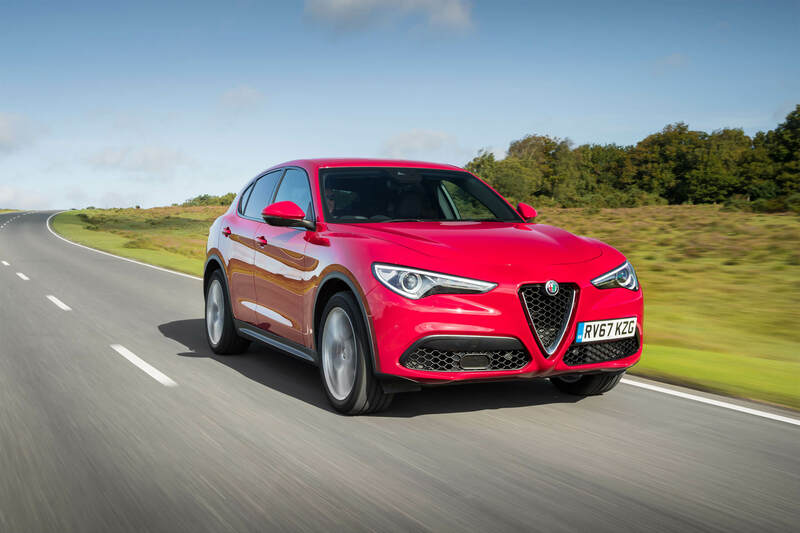 Alfa Romeo, which has become notorious after a decade of announcing and then delaying models, takes a huge step toward finally getting its portfolio together with the arrival of the Stelvio. That said, the brand has not yet revealed any dimensions, pricing, or an on-sale date for the vehicle. 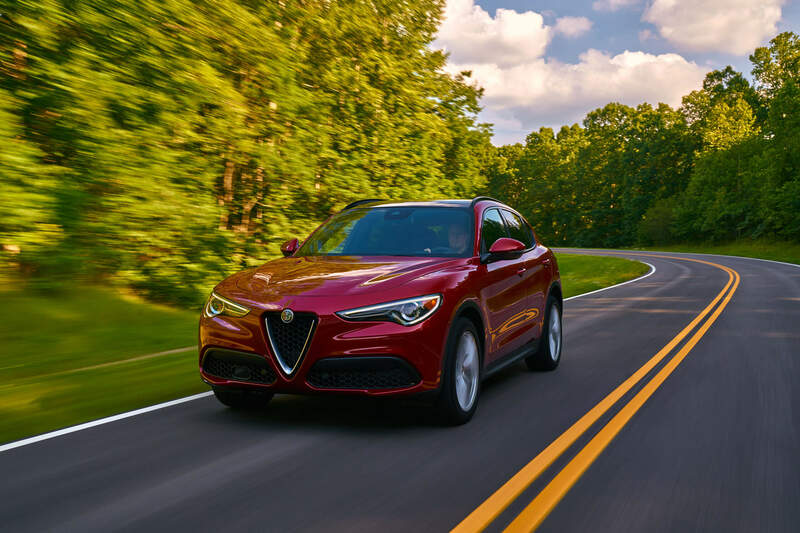 Although we’re anxious to drive it, a part of us wishes Alfa had kept the Stelvio tag in its back pocket to use for a pulse-quickening, high-performance sports car or sports sedan rather than an SUV.